Hong Kong Fashion Geek: Hair we go again. If you happen to be reading this in a public place, (presumably in Hong Kong) take a minute and look at the guy nearest you. Now study his hair. Fucked up, right? Guys here in Hong Kong have some pretty questionable hairstyles. I’ve lived in a few countries and I’ve seen some massacres (my own notwithstanding) – but no one does a bad haircut for men like Hong Kong. For whatever reasons, hair can’t be cut or styled in a simple manner anymore. You’ll rarely see a nice, normal fade from a number 2 on the sides. Instead, you’ll see a lot of weird partings where the hair is cut shorter on the right so that the hair falls abnormally to the left. You might also notice dye jobs in colour combinations you’ve never imagined. And if you’re really keen of eye, you might get treated to various bobs, fringes and undercuts. Don’t even get me started on hair wax and guys preening in the elevators. I guess with a city with over 7 million people, standing out is a tremendous task, but sometimes I’m not sure that it has to do with simply being different. Some of the hairstylists I’ve encountered always want to do something fresh and new, which they charge a premium for. 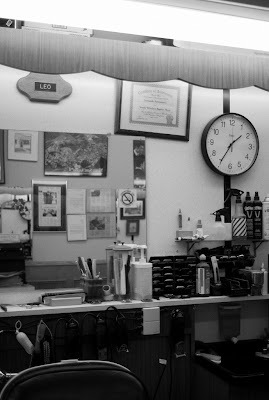 What happened to good old-fashioned Barbers? I don’t want someone with something to prove. I don’t want a full body wash and loads of product in my hair. I don’t want that smug smile from the receptionist. And I don’t want to tip everyone in the place. I want someone like my old Italian Barber, Leo. Leo cut my hair from when I was 15-years old. I went back to Canada recently for a visit and I was extremely happy to see that Leo’s place hadn’t changed at all – not even the prices (For reference, I am far from being a teen now). That is incredible. What’s even more incredible is that he cut my hair exactly the same as when I used to visit him years ago. Some may think that’s fucked up, but I’ll take the same old cut for the same old price over something fresh and new any day.